It's felt like a long time since last weekend was rained out. I am looking forward to this weekend as it is the first 8AM-noon session of the season. I heard from RML that a coffee dispensary did their thing near us Sat; I'm eager to check that out and see what they're all about. This is an idea I had for the next phase of build-out. Let me know what you all think. I've started a bake stand near the Farmer's Market, and I was thinking about starting pedi-delivery to select neighborhoods, specifically Watts-Hillandale and Old West. That means, I would bake early in the night Saturday morning, package everything for delivery, then ride my bike with peditruck/trailer around the neighborhood and make deliveries in the AM. Deliveries would be on Saturdays only, and you can pay what you like (that is our equal-opportunity business model). I would aim to deliver 1 pound of goods per delivery: 1 pound of bread (e.g. a large boule), or a pound of bagged cookies, or scones, or savory biscuits, or something like that. Most of my customers at the stand pay $2-5 for that amount of goods. Monthly subscriptions would be handled via paypal, cash, or check. The reason that I am posting this here is not to solicit, but instead I would like to know if you have any ideas for tweaking the concept. I want the community to have a voice in this. I will be canvassing to get the word out soon. We started giving away little cards with our name, Facebook, and blog address to customers. I've probably given away maybe 40 in the last three weeks, and we've gotten about 10 new "likes". Not a bad hit rate (25%) for a little scrap of paper. I'd like it to be higher though. 40 of our 60 followers are personal friends of mine on Facebook. Maybe things will accelerate if I start giving out codes on Facebook redeemable for free stuff? I got the idea, in part, from this article. I think it's an investment to give away a free cupcake to anyone who remembers a codeword, as one entrepreneur did, but his fan base rose seven-fold as a result. I really enjoy using Google Analytics for stats. It's really easy and informative. Blogger also integrated a mini-analytics tab into their blog dashboard that is pretty good. We've had few people come to the stand and mention the Indyweek article. Based on hits to the blog and facebook, it looks like several hundred people read it. I think it may go to show that the culinary illuminati of Durham may read everything on Carpe Durham, but they may not go to every restaurant, etc. Nonetheless, it was good publicity. We will need to figure out a more broad-based appeal to get to more customers and build the brand. In terms of signage, I thought of buying a large vinyl sign to hang under the table, but in the end decided it would make us look too much like a budget Obama for America canvassing table. We're currently deliberating making a mosaic sign. I did buy some chalkboard markers. Those things are the shiznit! Now I can write descriptions of everything in small type on one of our extra chalkboards. Highly educated people of Durham love to read, so the markers are another valuable means for content creation. By comparison, I enjoy the lengthy descriptions of spices at the Savory Spice Shop in Raleigh (e.g. a two paragraph piece on how Himalayan salt is harvested and transported out of a treacherous mountain range). Week Nine was off the charts. We did our highest sales as yet. The beautiful weather (80 and sunny) helped. Many Jewish customers were hyped by the presence of the hamentashen, saying that they couldn't find them anywhere else. Many non-Jewish customers who had never heard of hamentashen before were impressed and enjoyed hearing the story of Purim. One customer who was half-Jewish, half-Irish thought it was fitting that I was also selling Irish soda bread that day. Thanks to LP and SZ for helping out. LP, that Angola funk compilation was smash. Many thanks to Jerry + Jenny, Kelly, Chase, Michael James, and Jon for dropping by. I made a test batch of sweet strawberry-filled hamentashen two weeks ago. They came out pretty good, although I will make the shortcrust dough a little stiffer Saturday so the hamentashen retains its shape better. 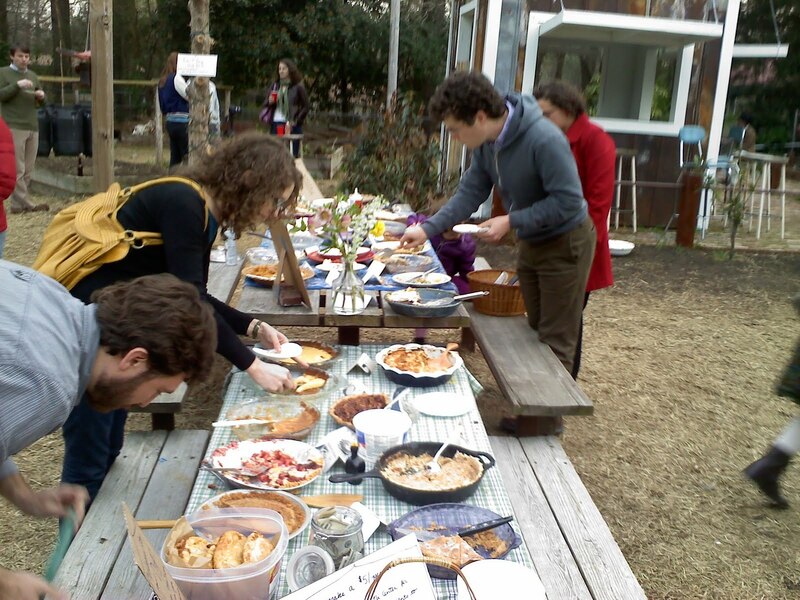 yesterday was pi day, and i attended a gathering at Johnny's organized by emily hilliard to celebrate. i brought two banana cream pies. they were supposed to be filled with tapioca bubbles like you get in bubble tea but i think i boiled them too long and the bubbles disintegrated. more experimentation needed. best pie: pear walnut pie. when i complimented the baker on her prowess, i sort of got a "yeah-i-know" reaction that reminded me of this scene: http://www.youtube.com/watch?v=I-7f7vVCqvI. overall, the vibe was really good. music by by the Wildgeeses was special. consistency: if the crust is too "rustic" or mis-shapen, sometimes the homemade quality of pies overwhelms and distracts. filling clarity: if the filling is a mixmash of flavors, the pie can be tough to pull off. the use of spices should be intentional and subdued unless the spice is in the name of the pie. likewise, all the filling ingredients need to be cooked perfectly; no mushy apples! color: using egg wash to darken a crust is a good move, but can easily lead to burning. anything to avoid that "sandpaper" look. sweetness: sweet pies can be too sweet, leading to a muddying of the ingredient flavor. the ingredient (e.g. blueberry) should come bursting forth on the palate, without that itchy saccarine feeling afterwards in the back of the throat. restraint, restraint, with the hand that pours the sugar! this guy (below) won pie-eater of the day, in my eyes anyway. he took a piece of every kind of pie and then crushed the entire plate. this is him half-way through. by comparison, i had to stop after my fourth slice. through about half a pot of decaf, as well as four urns of regular. originally, i thought to start with a table, then a cart, then a food truck, then a small cafe, then bigger, etc. and grow the business that way if it took root. but watching the truck scene in downtown durham makes me wonder if there is enough density to eke it out as a food truck operator working full time (40 hrs) or part time (20 hours). in fact, i said, jokingly, to yoyo, that an Onion headline might read "Second Wave of Food Trucks Finds There is Not as Much Money in Food Trucks as Previously Believed". I know the tacquerias on Hillsbourough have been doing it for years, but I wonder what their revenue/margins are like. I know that Farmhand was trying to come through the NC Mutual building downtown where I work for several weeks (1x per week), but I doubt they did more than 40 lunch covers per meal. At $6 a sausage, they might net $125-150 after employee wages, ingredients, and overhead. Kind of a hustle. How many trucks do you think that Durham's density can sustain? 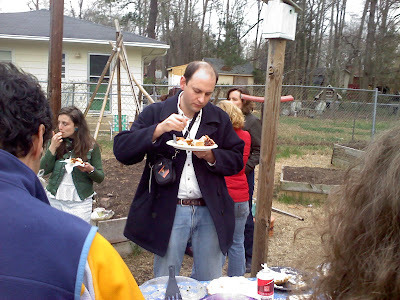 I know that a truck like Farmhand can kill it at a bigger event (as they have at Fullsteam or Motorco), but those events only come once or twice a month. Does Durham have the density or desire to support a food truck culture akin to LA, NYC, Chicago, or Portland? Does anyone know more about truck economics in Durham or the Triangle in general? after months of admiration from the cheap seats in barnes and noble, i broke down and bought a copy of this cookbook. Rao's is one of the most storied and exclusive restaurants in NY. but more than that, there is a focus on technique that has resulted in the distillation of Italian cooking to something like an ideal type. how to properly roast meat bones for stock. how to treat your san marzano sauce tomatoes. there is a love and attention to food there that is focused and learned and bleeds into their operating model of only 10 reserved tables for their weekly regulars, one sitting per night. they show a respect for their food that is synonymous with their culture and history (they first opened in 1896). i feel a good cookbook has not only recipes that work, but both a culinary and ideological consistency that unifies it. other examples: david chang's momofuku; kenny shopsin's eat me; chad robertson's tartine bread; darina allen's forgotten skills of cooking; rose carrarini's breakfast, lunch, tea. even irma rombauer's JoC, in its own encyclopedic way, has a consistency of writing and illustration that allows the recipes, formulations, description, and techniques to breathe 75 years later. I never made jerky before. I received a cow heart from Noah Ranells by barter in return for some baked items. This kind of lean meat is perfect for jerky. Recipe: Marinade the meat slices (1/8'' thick) in salt and spice for ~8 hours. Bake in oven on 125 degrees directly on oven-rack with aluminum foil underneath to catch drippings for 6-8 hours. The jerky will be dark and a little tough when fully cooked, but not brittle. My results: Pretty good. I salted it as if I was corning it, which was too much. A generous sprinkle is likely sufficient. Otherwise, it was fun showing up to a party with it and a partygoer immediately wanted to put it in his pocket to eat later. Because that's what you do with jerky. It travels anywhere. data driven: we focus on objectively observable phenomena when evaluating what works and what doesn't. nothing is sacred, nothing can't be changed, (almost) everything can be measured. open-sourced: to the best of our ability, we'll try to keep the books, processes, and recipes open. if you have any ideas, there are means to contribute and critique. sliding-scale: we don't price our items because this allows everyone to pay what they think the food is worth to them. all of our customers are generous. if push comes to shove, we will tell the customer what the average or range has been for a particular item. we're not out to stump anyone. Adam, very good article man. You're a don. I hope that everyone can live in a world where their humble $200-a-weekend food stand can get press in a free weekly read by 45,000+. Newcomers to the blog: If you want to learn more about pay-what-you-like business models, check out One World Everybody Eats in Salt Lake City. Wanda and Earl Boone tried to open One Durham Everybody Eats at the old Hartman's Steak House on Geer St., but the venture failed due to lack of sufficient funds to get the restaurant back up to code. We really have to come correct now. On the plate for next Sat: Walnut Raisin Mandel Bread; Magnum Opus Chocolate Chip Walnut Cookies; Mini-Magnum Opera (opera is the plural of opus). Friday AM: Feed sourdough starter. Add about 4 cups of water and 8 cups of flour to 2 cups of starter. Friday evening: The starter has risen and has a nice tang to it. Reserve some of the starter for next week. Add 20 cups of water and 20 cups of flour. The consistency is very thin. This mixture will bubble up and provide the flavorful backbone to the bread. This is called a levain, or poolish. Chad Robertson of Tartine Bakery says that the levain should be "floral, fresh, creamy, silky, sweet, milky." Saturday, 2:30AM: Add 11 cups of water, 44 cups of flour, 5 oz yeast, and 8.5 tablespoons salt to the levain. Knead the dough. Saturday, 5AM: Drive the rising dough to the bakery. Sat., 5:45AM: Cut and weigh the dough into 1-pound blobs. Shape the doughs into boules. Coat some of the boules with poppy seeds or sesame seeds. Place the boules in the proof box to rise. Sat., 7:30AM: Score the risen loaves with a razor blade. Place in a 425-degree oven for 25 minutes. Sat., 8AM: Cool the risen loaves in the open air and take to market at 9:50AM. Quite a process. My results have been pretty good. They could be better if 1) I was using artisian bread flour instead of unbleached bread flour. Artisian bread flour is lower in protein, allowing for a softer, more open crumb. 2) If I was using a hearth oven instead of a convection oven. The hearth oven gives the bread a great crust, and the crumb a more intense texture. Everything went pretty well this week. CW helped me with the baking in the morning. In an hour, he went from novice to expert donut fry chef. Those donuts sold out in only 1 hour 15 minutes. Granola came out good. Lots of compliments. It was the last week for the French bread, at least for awhile. I got the recipe pretty close to where I want it. Time to move on to new things. See here for more details. We had some customers this week with some very definite opinions about our business prospects as a "fair price" bakery. One gentleman named Frank asked us if we knew we were in the U.S. Another woman told me that I might want to think about taking some business school classes, because our model was fundamentally bankrupt. She said wealthy people enjoy supporting businesses that charge high prices for premium goods. I'm not sure that is true, and secondly, that would squeeze out the customer base I want to feed most. I told her our position as a bakery trying to make inroads into other income class markets, and that I would give her suggestion serious consideration. Many thanks for LA, RML, CW, and SZ's presence at the market this week as helpers. You all are awesome. Thanks also to Heather, Adam, Jerry and Jenny, RML, CW, LA, yoyo, EC and RG for coming out. Watching my friend RG dunk a cake donut in his coffee and eat it in 2 bites has to be one of the highlights for me of running the stand thus far. I started this thing by bartering with vendors at the Farmer's Market in Fall 2010. They received it really well. And it was a good deal. I got bagfuls of veggies and fruits in return for my baked goods. So if you want to barter with the stand, bring it on!